A later edition of L.P. Holmblad's 1850 Tarok deck published by S. Salomon, c.1906. Above: cards from a Tarok pack published in Denmark by S. Salomon & Co. of Copenhagen in c.1906. 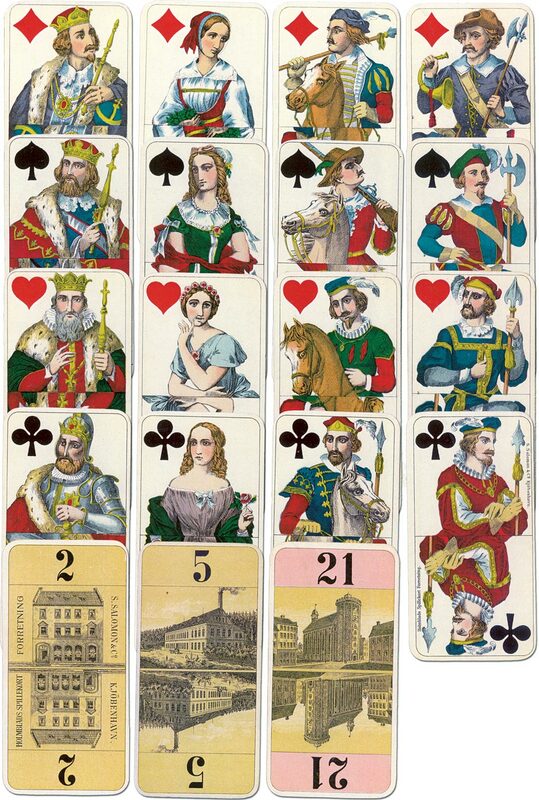 The cards were actually printed by Piatnik of Vienna, whose factory is shown on trump no.5. The Salomon retail store is depicted on trump no.2. By this time the numerals had changed from Roman to Arabic. Images courtesy Hans Jørgen Hinrup and taken from article published in The Playing-Card Vol.31, no.5, IPCS London, March-Apr 2003.